The world of Academia consistently pushes back against any proposal that would legally allow a college/university student to carry a firearm concealed or openly on a school campus. Each year another state moves forward in allowing campus carry and we see the protests from students, the petitions from professors, and some other interesting tactics in opposing the legislation. In Texas we recently saw professors holding office hours at off campus bars to prevent students from bringing guns and a professor who wore body armor to class to express his opposition. I have some sympathy for people who emotionally show concern related to guns and concealed carry. I don't have any sympathy for people who seem incapable or unwilling to take a logical, data driven approach to considering the problem. Campus carry is NOT new. We now have over a decade of data from states like Utah and Colorado who have been allowing campus carry for tens of thousands of students year after year. So I would expect, and ask candidly, that University professors be capable and willing to set aside fears and emotions and look at the data to understand the probability of these fears becoming a reality. History has shown many times that we can't trust our emotions to paint a truthful view of reality. So, professors and other faculty are you willing to look at the data with me? Is There Any Data To Support The Concern? Currently there are 3 states that fully, by statute, allow any adult with a valid concealed carry permit to carry a concealed firearm on any public University campus. Those states are Colorado, Idaho, and Utah (Green on the below map). As you can see from the map below there are a handful of other states (Arkansas, Kansas, Mississippi, Oregon, Texas, & Wisconsin) that allow campus carry but ALSO allow schools to put into place some form of restrictions on the students (Grey on the below map). Put differently, in Texas for example the University of Texas cannot fully prohibit concealed carry but they can require those carrying on campus to use holsters with active retention and can prevent carry in certain circumstances or environments on campus. In addition to those states there are a handful of other states (Yellow on the below map) that leave it up to each individual school to decide if they will allow campus carry or not. Now, consider that of the states mentioned above, Texas, Kansas, and Arkansas have only allowed campus carry for less than 2 years. Mississippi only allows those with enhanced permits to carry on campus, and Oregon and Wisconsin don't have clear data to work with. So for the purpose of our article today I'm going to include student population (Total Universe) from only Idaho, Utah, and Colorado; HOWEVER I'm going to include ALL negligent or illegal acts from on campus permit holders everywhere. I realize this isn't apples to apples and in fact will favor the anti-gun rhetoric but stick with me and I think you will see it works out. So How Many Total Students Are Carrying? Data From the National Student Clearing House shows a total of 697,158 enrolled higher education students combined in Colorado, Idaho, and Utah as of the Fall 2016 semester. Within that number we have to subtract the total enrollment from private universities since they are not required by the state laws to allow campus carry. So combining the enrollment of private schools in those 3 states we subtract 151,204 students being left with a total universe of 545,954 students actively enrolled at one time in a school that allows campus carry. So applying those percentages to our state numbers (minus the private schools) we get a total of 365,656.67 students that attend a campus where campus carry is allowed and are of age to obtain a permit in the 3 states of our data set during the fall 2016 semester. Next we have to make a guess as to the percentage of those students who have a permit. The most recent report from the Crime Prevention Research Center suggests the following percentages of Adults in these states currently have a permit. Colorado – 6.1% | Idaho – 11.60% | Utah – 11.6%. Now, one could easily argue that a student is less likely than the general adult population to have the desire or funds to get a permit. To be safe and conservative lets assume that a student is half as likely as the general adult population to obtain a permit which essentially cuts those percentages in half. Applying that to the number of “eligible” students in our data that totals approximately 16,876 permit holders that are students in the 2016 fall semester in those 3 states. So now we have a number of 16,876 but that only represents 1 semester. Colorado has allowed campus carry for the last 28 semesters, Idaho for the last 5 semesters, and Utah for the last 22 semesters (I'm excluding summer and only counting fall and spring semesters). If you take the total permit holders per state multiplied by the number of semesters in each state and add those 3 totals together you get the number of 461,940. That is conservative … not including summer semesters, assuming 21+ yr old students are half as likely as the general adult population, and only counting student permit holders from 3 states (excluding big ones like Texas, Oregon, Wisconsin, and others) meaning the number is likely significantly higher. However, let's just say 500,000 to keep it easy and VERY CONSERVATIVE. Now I realize my method of data analysis isn't perfect and many people reading this will probably poke some holes … but I'm confident that if I really went deep into the data and did it perfectly the number would be HIGHER, not lower than 1/2 million. More than 1/2 million semesters of school have been completed by permitted concealed carriers on a University Campus. How Many Incidents Have Been Reported? How many times has a student or faculty member with a valid concealed carry permit, from ANY US STATE, broken a firearm related law or committed a violent crime with the gun present on a campus where campus carry was permitted? ZERO TIMES. Have there been negligent discharges (accidental shootings with a gun)? Yes. Four reported incidents ever. Have there been violent crimes committed on college campuses with guns? Yes. Duh … of course. Violent crime happens everywhere and University campuses are not magically exempt from bad things happening but ZERO of these were committed by students with a valid permit on a campus where campus carry was allowed. So the odds of a student permit holder committing a violent act with a gun are zero. The number of students being more than 1/2 million … statistically speaking the odds are still zero, and that is pretty darn good. Now I recognize there will be a first time. When that happens remember two things. Statistically speaking you'd be about as likely to be hit by lightning than to have such an incident occur even after it has happened once (which it hasn't yet). Second, when that day comes that someone is the first, you may want to ask yourself if that proves causation. Just because the stars aligned doesn't mean the lack of campus carry laws would have prevented that incident from taking place. I've not attempted in this article to make any arguments in favor of campus carry or to dispel all the arguments against it. I am simply trying to make the case that the data; the raw numbers suggest that the emotional fear of violence that will stem from Concealed Carry on Campus is irrational. For a faculty member to think that a heated discussion, poor student grades, office hours, or other young wild student stuff will cause a student to start shooting others is statistically unfounded. 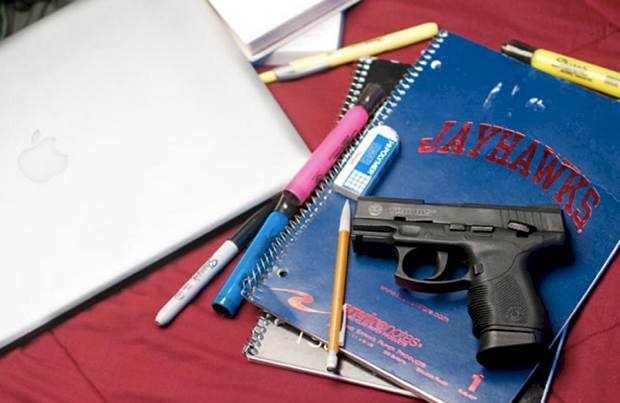 A person has to be 21 to ‘lawfully own’ a pistol; how many ‘college students’ are 21 or over? Not that many; AND how many of them want to ‘carry’?? It is much to do about nothing…. Barbara you are confusing buying a pistol with owning one. You can certainly legally own (and carry one) in same states at 18, eg new Hampshire. In any case the article does FULLY control for eligibility age in the states it looks at. As the article intelligently shows it is about half a million “man (or woman) semesters” so far (which is tens of millions of carry hours) and no violent incidents, and a couple of no injury NDs. There are probably a few hundred crimes prevented with that number of carry hours. its a must in these days and times that all law bidding citizens have the right to protect there life ‘[dark times’ not mentioned if a crazed man was shooting up my class mates and came near me he would get 2 to the chest and 1 to the head ending the school shooting and saving many lifes on campus.